When you watch Chris Evert play tennis, notice her converse shoes. 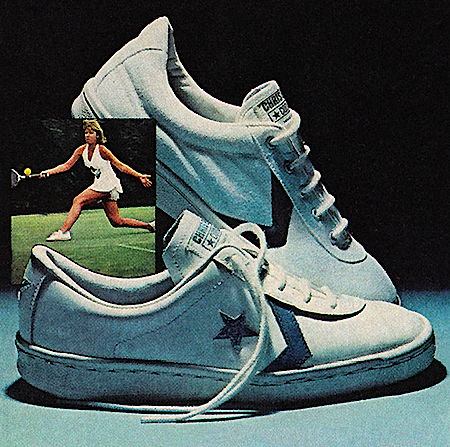 Chris Evert’s shoes are important to her game. She spends nearly five hours every day in them. She’s been wearing Converse for over a year now. She wanted a new, more comfortable shoe. She wanted a different style. And she wanted an American manufacturer. Her new Chris Evert shoes feature comfort, come in two widths, feature shock support from heel through arch, and stress supporting uppers of light deertone leather or cotton foam – lined fabric (depending on the type you prefer). When you play in these shoes, you’re actually playing in Chris Evert’s shoes. She doesn’t use any special models. What’s good for Chris’s game can be good for yours.